Once we get into the scrimmage area with our offense, there will be nothing that we do as far as movement that will not begin with a V-Cut. It is our base cut for all that we do in terms of setting up our cuts and screens. 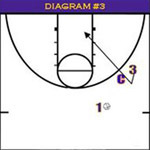 The ability to incorporate the v-cut into our offense again lends support to being hard to guard. It is a maneuver that keeps the defense from easily anticipating our final cutting direction  especially since it is the positioning of the defender that tells us which way to start our v-cut. For instance, if the defender is below the cutter as shown in Diagram #1, the offensive player will start the v-cut by also going low. We want to start all of our cuts with a two-step set-up. The two-step set-up should be a slower movement as opposed to a full sprint. In fact, our terminology for the movement of the two-step set-up is referred to as “walking your defender down.” The offensive player, after taking two steps towards the baseline, will then plant the outside foot and accelerate into the cut. 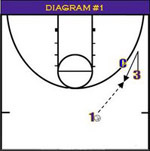 The final part of the cut should be a sprint towards the basketball to shorten the pass. The obvious reason for the change of speed is it is still yet another area in which we keep the defender off balance and stay hard to guard. Notice in Diagram #1 that the two-step set-up is towards the baseline as opposed to a two-step set-up towards the lane as shown in Diagram #2. The reason we don’t V-Cut towards the lane is because of spacing. We want to keep our perimeter players on the perimeter and don’t want to drag a defender towards the lane, clogging up the paint, especially on a set-up cut. Diagram #3 shows the defender up in the passing lane. We want our two-step set-up cut to also go high, encourage the defender to go even higher. We then want to again plant the outside foot, and explode on our cut to the basket. The other possible scenario is when a defender is playing us straight up (not really leaning towards the baseline or up and in the passing lane). When this occurs, we want the defender to make a cut that is advantageous for us at that point. This comes from a player’s understanding of their strengths and weaknesses as well as their ability to recognize what is going on that particular possession. If this particular player is good at posting up, we might want her to start high and cut to the basket to post up for a 2 count. If she is a good perimeter shooter, we might want her to start low and pop out to stretch the defense and create some spacing. A non-shooter might want to start high and cut through and back screen her way out or start low and pop out to act as a receiver for ball reversal. As you can see, there are various options depending upon the situation. 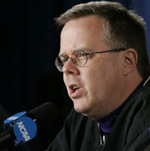 Bob Starkey is one of the top minds in all of girls college basketball. His latest project is a Basketball Coaching Series of books that include The Art of Being An Assistant Coach, The Art of Scouting and The Art of Motivation.